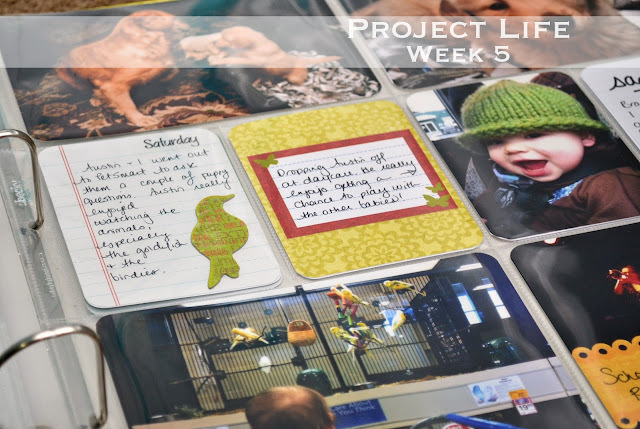 Welcome to Project Life Tuesday, Week Five. I apologize for the not-so-great photos this week. I had to do my Project Life on Monday rather than Sunday, so I had to take my pictures at night without natural lighting. I'm finding that these layouts are both fun and a bit of a struggle for me. I have this intense desire to come up with creative touches to the album, and that is a little stressful. I find myself comparing my layouts to others I see online and feeling that they're just not good enough. You can see that I have an insert this week. 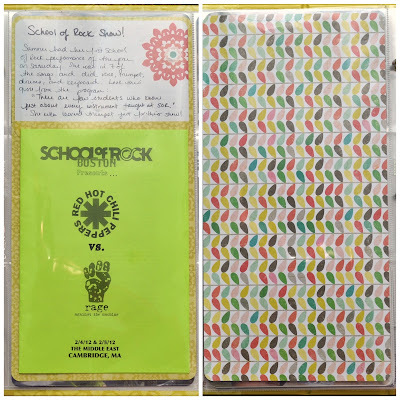 I took the program from Summer's School of Rock show and a 4x6 journal card, attached them to some of the Amber edition paper, and inserted into a 12x6 page protector. 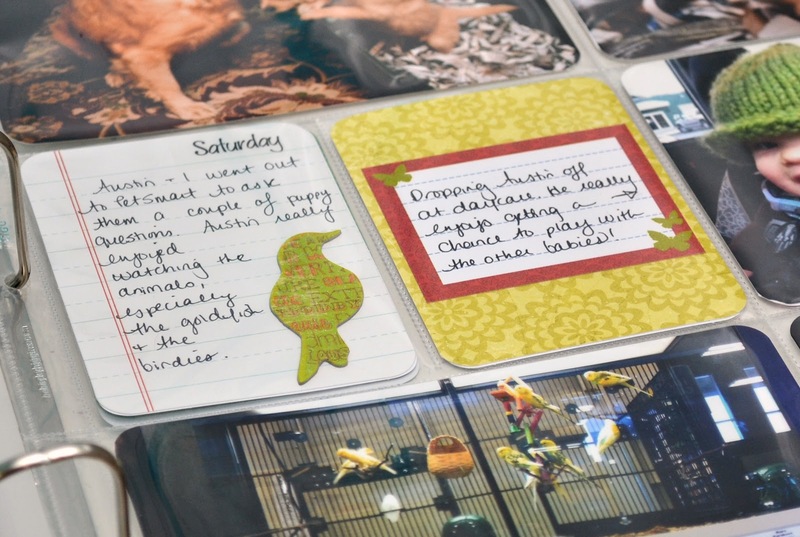 On the journal card I included a quote from the bio on Summer inside the program. Her bio was really awesome and acknowledged that she plays pretty much everything. She sings, plays guitar, drums and keyboard (all really, really well! ), and she actually learned the trumpet just for this show. 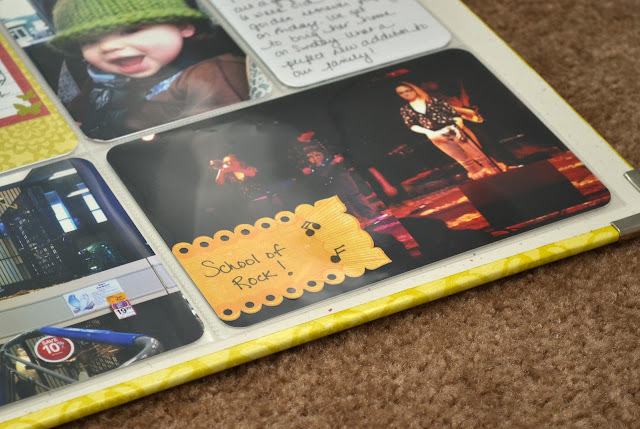 I also used some embellishments this week in my album. 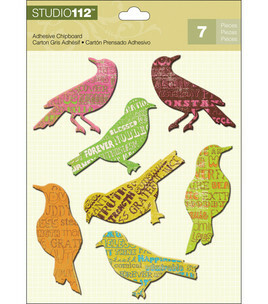 In the above photo, I used a chipboard bird sticker from Studio 112. I've had these since around Christmastime and have been itching for an opportunity to use them. I thought the bird went perfectly with the photo of Austin at PetSmart. 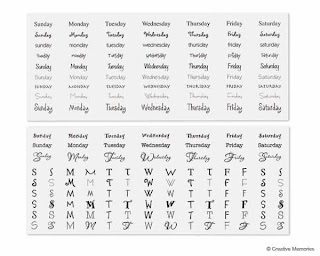 Also above is a Saturday day of the week sticker from Creative Memories. Lindsay passed along a sticker kit called Calendar Weeks and I thought they'd be perfect for Project Life! And then the red bordered butterfly journal spot was part of a clearance pack at Michaels I picked up last year. The label on Summer's performance photos is from K&Company. 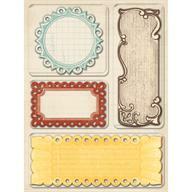 It's part of the Wild Saffron Die-Cut Tags pack. The color on this photo came out kind of red, and I didn't feel like spending the time to correct it, so I converted it to black and white instead. I love the effect. That's all for this week. Be sure to stop by The Mom Creative and check out everyone else's posts! 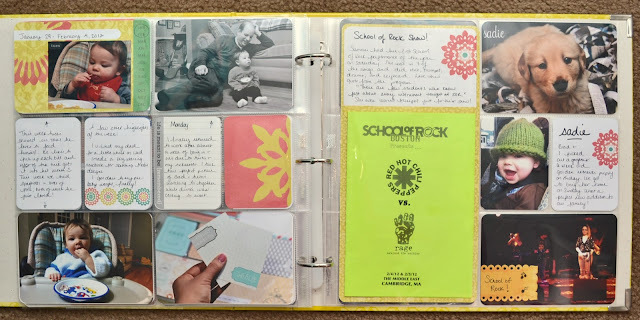 When I get overwhelmed looking at other layouts online I remember that when I (or my family) look back years from now at Project life all I'm going to care about are the stories and the pictures. I've decided to free myself of worrying about adding so much. That's a really good way to look at it. Maybe if I keep that in mind it'll make it less stressful. I just love all those pages that have little extras, too. Your pages look fabulous this week! 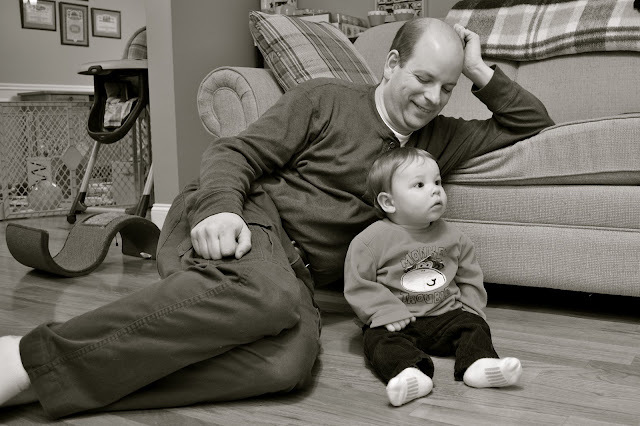 I love the b&w shot of them watching TV, I need to remember to convert to B&W more often. Don't compare yourself to others you see. I started project life 3 years ago and spent hours and hours trying to add little bits of stuff and only made it through 2 months....I finished the photos for the entire year, but never the album. Last year I took my pics, but again, the idea of detailing was overwhelming and I am addicted to scrapbooking! I decided to use the digital album and LOVED it. Soooo easy, so editable. Just drop and drag, add text and done. I am doing that again this year. A lot of rambling for a simple point.... My 2011 album is done and it is meaningful for my family and I. Yours is beautiful! Thank you! 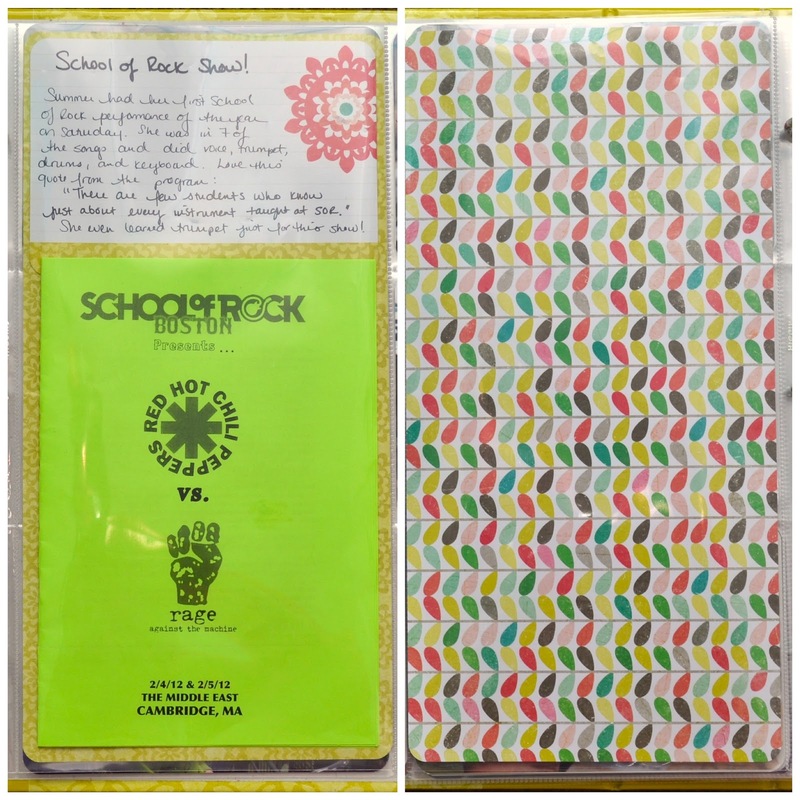 I do like the digital album stuff too (and I use some of the digital elements to print to add to mine) but I am definitely more of a "I have to touch this!" kind of girl, so I just can't bring myself to make that leap. I'm so glad it's worked for you though! Love your pages! Super cute! Love your clean style and your added touches!!! I like your 6x12 insert. I don't have an oversized printer so I've been looking for ways to use those page protectors... good idea! I don't have an oversized printer either, actually. I have an Epson Workforce 630 (or 635, not home, can't remember) but it supports legal sized paper (14" length). You should take a peek at your printer manual (or do what I did, and google it), you might be able to print on legal which would solve the problem! Those photos of the puppies are adorable. Like the other commenters I have said, don't compare your PL to others. This is YOUR PL and you do it however it works for you. Your pages look fab and capture your family adventure. I am keeping mine pretty simple - I figure some times I'll be more artsy than others, but I'm not going to get hung up on making it a masterpiece every page. Done is better than perfect. What I care most about it recording the moment! You're doing that brilliantly! I LOVE your layouts! I really do. I especially love the picture of Sadie playing with her mother and sister. So sweet. I love you! I just love that little green hat!! Too cute! That was knitted for him by my friend Lindsay! I can relate to what you said about feeling like you have to add the special touches and not feeling like your pages are not good enough. 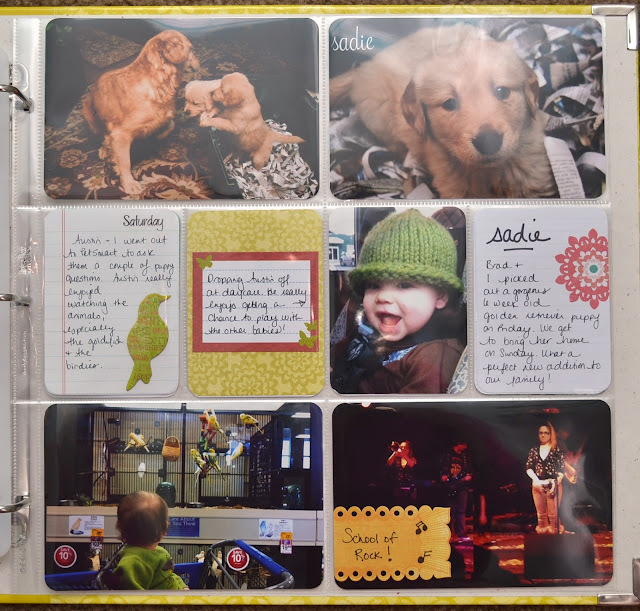 I have been having some PL envy myself, but keep on telling myself that it's about saving memories for my kids. After all, they are the ones who will get the most out of PL and they won't care if I used the lastest techniques or matching papers. Very true. Also, I love that term "Project Life Envy." That's pretty much exactly what it is! I hear you about staying on top of it. 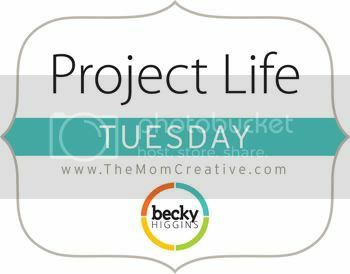 I started Project Life mid last year and the fall season got so busy I found myself four months behind. I ended up quickly just doing one layout per every couple of weeks (or per month) to catch up and was glad to just be done with it. 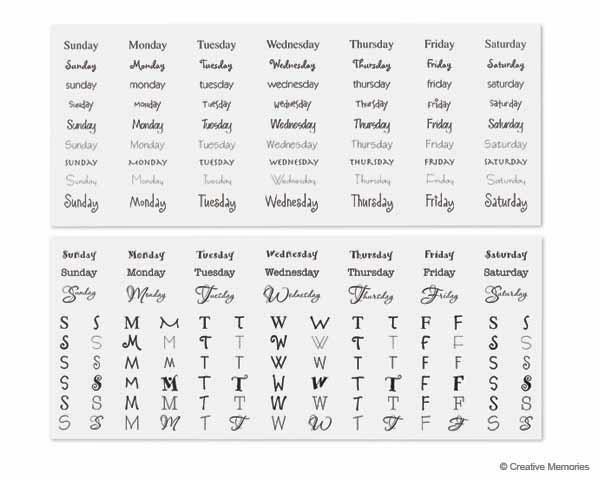 This year I'm aiming to make sure I stay on top of it each week. Your pages look great! Don't get overwhelmed looking at other's pages. 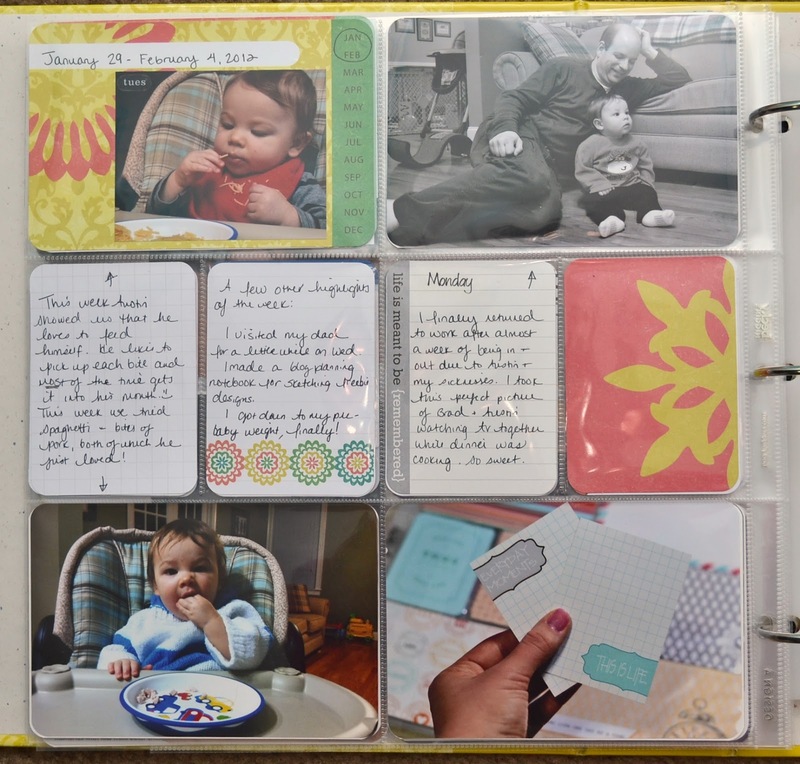 The fact that you are documenting your family's lives is HUGE! Kudos to you. Love the pic you added of your hubby & son at the end. So precious! I have limited myself to only a select few PL blogs that I read & yours is one of them, I like that you keep it simple but still have your own style shine through, some weeks mine is super creative, some weeks it's simple & some weeks I get way too distracted by all the on-line stuff & my plans for my album that I think it's strange that I don't have anything about my project life album in my album, so I especially loved seeing your photo of your album in your album! Wow. That is an amazing compliment. I am honored to be one of the ones you follow. Thank you. This is my first year doing PL and I started because it was so simple. But now, like you, I'm overwhelmed because there's sooo much creative stuff online. In comparison, mine looks super plain and I forget that I started this because it was something I could keep up with. 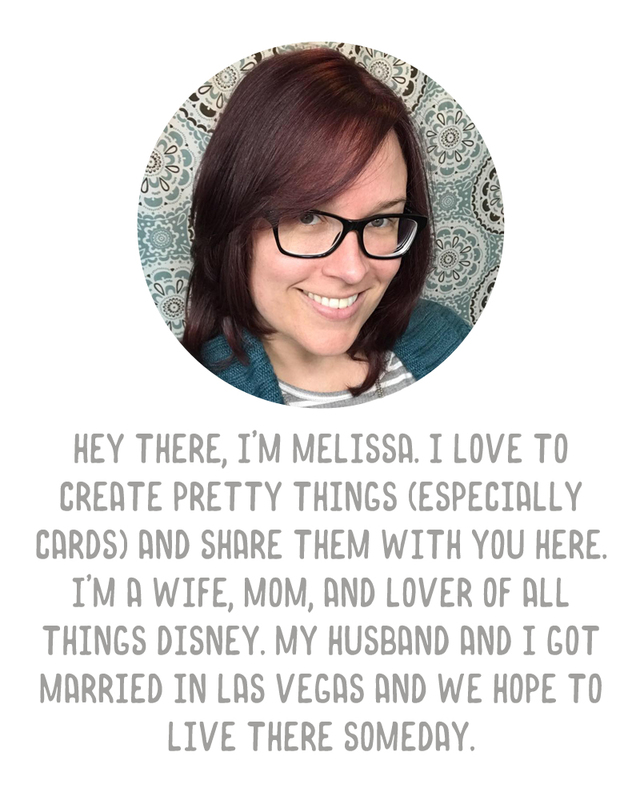 I just discovered your blog today and I'm LOVING how you use the PL kit, but add enough extras to make it personal and beautiful. Your album is super inspiring. I love it. Thanks for sharing it and all the freebies. You are so kind.